We arrived after midnight at Kandla town in Shamli district of Uttar Pradesh from Delhi. This is a Muslim majority town, where a few thousand people displaced by the Muzaffarnagar carnage of 2013 who were not allowed to return to their homes, resettled. BJP member of Parliament Hukum Singh had hit national headlines alleging that the rise in Muslim population in the town threatened the peace-loving Hindu residents, resulting in a large exodus. It was established that his claims of a Hindu exodus were mischievous and entirely false, but the stigma persisted. Singh later retracted the statement. It is remarkable that even the National Human Rights Commission intervened on the basis of this clearly communally motivated complaint, but did nothing to support the cause of nearly one lakh Muslim people who were displaced because of the 2013 carnage. We felt that Kandla would be a fitting place for the Karwan to spend the night given the fact that it was communal stereotyped for giving refuge to internally displaced people. We found hospitality in a madrassa. In the morning, we visited a village that briefly hit the headlines a few months back, and then faded away from public memory, Shabirpur at district Saharanpur in the Deoband constituency, 150km from Delhi. 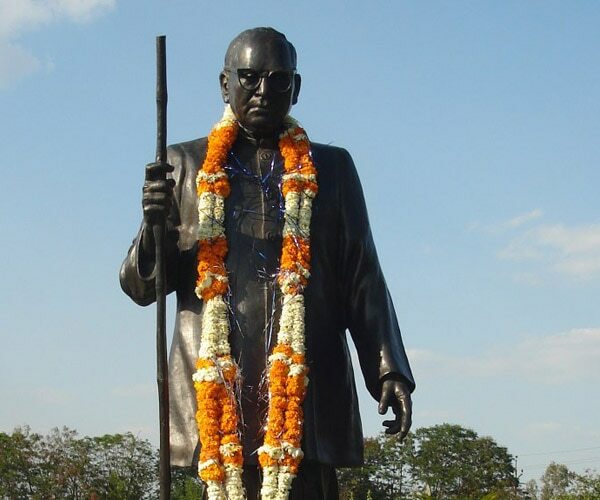 The dispute started when Dalits of the village decided to build a statue of Dr Bhimrao Ambedkar on the premises of a Ravidas temple. They pooled money for the statue. The construction of a tall platform began. All preparations were in place to install the statue on Ambedkar's anniversary on April 14, 2017. Rajputs objected to the statue of Ambedkar pointing to the village road which they use along with the Dalits. Meanwhile, the BJP swept to power in Uttar Pradesh. An ugly rumbling started in the upper caste Rajput enclave of the village. "They objected to the tall platform and even more to the statue of Ambedkar pointing to the village road which they too use. It is our government now, they are reported to have said. They felt the chamars needed to be reminded of their position," said a villager. "The Dalits protested angrily that they had legal title to the land of the temple, and it was for them to decide whose statue they wished to install on it. The administration intervened, and asked them to apply for permission, and the anniversary passed without mounting the statue." On May 5, the Rajputs decided to celebrate Maharana Pratap Jayanti, the anniversary of the Rajput icon, with unprecedented pomp. The procession began with a loudspeaker blaring loud music, what they call in the village a DJ. The sullen Dalits went to the police station, and complained about the DJ. "If we need permission to install a statue on our own land, they need permission to play a DJ on a public road. The police concurred and ordered the DJ to be disconnected," he said. The Rajputs took this to as an insult, and erupted in rage. They made a call to their caste men to gather from many surrounding villages. They came on motorcycles and cars to the Dalit basti with daggers and swords. Shouting insulting slogans, they attacked women and men, and set fire to more than 30 homes, vandalising their utensils, furniture and television sets. The police stood by for five hours doing nothing to restrain the attackers. Rajput men blocked the fire engine from entering the village with their tractors and cars. Four months on, we found the Dalits in grave economic distress but unbending in their rage and resistance. Most of them were landless, and earlier found work in the fields and brick kilns owned by the upper castes. But they are now unemployed because the Rajputs imposed a strict economic boycott on employing anyone from the village. The government released a small grant of Rs 25,000 to each household, but withheld further releases claiming there was no budget. Few of the men they named were arrested. But the police charged the Dalits, especially their vocal leaders, with even graver crimes, and many Dalits are in jail. Dalits have for centuries been suppressed in their rare moments of resistance, their dissent has been firmly and cruelly crushed. But the Dalits of Shabirpur we found were unrelenting. They decided to renounce the Hindu faith, and immersed all their Hindu idols in water. They converted en masse to Buddhism. Jai Bhim was their call to battle. Even children wore Jai Bhim lockets and fought with their classmates and teachers. In our meeting, the women were most vocal in their resolute defiance, not hesitating to speak publicly about the assaults on their bodies - crimes the police continue to ignore. A few Karwan members went to speak to the Rajputs. They remained contemptuous of the Dalits, claiming that they had set their own houses on fire for the compensation. When asked if they had injured themselves as well, they did not answer. But there was no remorse. We left Shabirpur inspired but intensely troubled. Many of the Karwan members had never witnessed first-hand accounts of atrocities that are routinely perpetrated to tame Dalits and adivasis into submission. The Dalits of Shabirpur have decided to fight for dignity and equality at a great cost to themselves. They fight not just for themselves but for all if us.